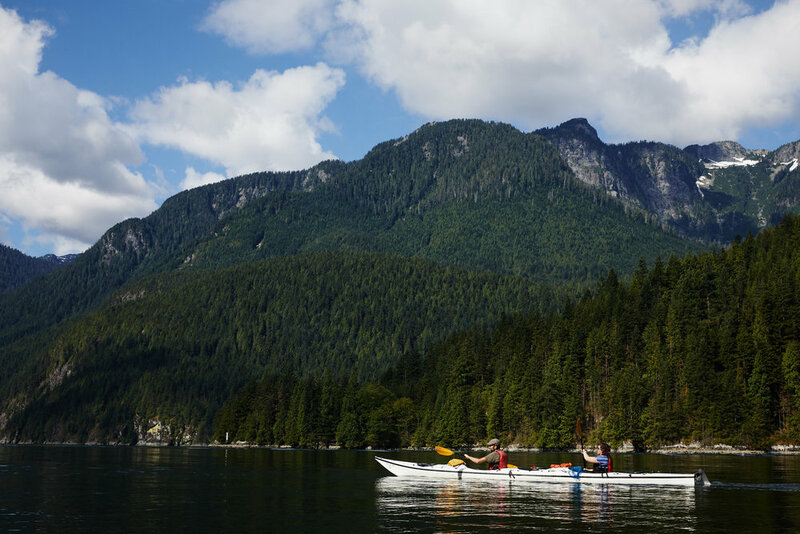 Paddle the west shore to Croker Island from Deep Cove, take the west channel between Croker and the Mainland, once you round the northern end of Croker you will see Granite Falls on the east shore. We started in Deep Cove and rented the Kayaks at the kiosk there. We took 3 doubles and 2 singles. While the singles have more freedom, they can be slower and more difficult to fish from. In the distance you can see one of the Buntzen Lake power stations. They were built in the 1900’s and almost have a Gothic look to them. A closer view of one of the power stations. There were thousands of jelly fish in parts of the Indian Arm. Most were smaller jelly fish but we saw few of these huge Lion’s Mane jelly fish. With the help of the tide and wind, we arrived at the falls just 3 hours later. We found a camping area right next to the water and had clear skies the first night. One of the smaller jelly fish we kept seeing. The Milky Way was directly above us later in the night. That morning Tom attempted some fishing but was only able to catch a few Rock Fish, which you have catch and release. The seals will hang out close by in hopes of stealing your fish right off your line. On the way back we had a good view of the falls where you can see people that have climbed up a portion of them. Climbing the granite was fun but on the way down we took a path that parallels the falls on the right in the forest as it was much safer. Near the top of the falls is hidden swimming area that had a few things you could jump off of into the deep waters. I’m not sure how this could have happened, but a golf ball was embed half way into the granite! After swimming at the falls we headed back to the campsite. We brought some fish heads with us to use in a crab trap. The next morning we began to make our way back to Deep Cove. We left early to take advantage of the lack of head winds in the morning. We stopped at Twin Islands just before Deep Cove for lunch. Jenn had to brave the jelly fish to rescue two beers that we had put in the water to chill and had then washed away.